Welcome to checkonsafety.com this site has been designed to assist with safety issues at work or at home. The site was started by Shane, a US Army Veteran (retired), who currently serves as a Data Manager for DOD, Army Service Support Command Safety Division. 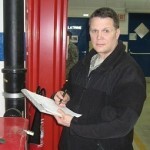 Shane has been directly working at the Brigade or higher DOD Safety field since 2003. He has five years experience with a Combat Aviation Brigade, served as the Tactical Safety Manager for US Army training units in Bulgaria, and currently sustains accident reporting records, collects and analyzes statistical seasonal data from various stove pipe agencies including, law enforcement, medical and logistical databases. His current work involves transformation of stand alone personal computer systems records to collective web based interface for inter and intra net communications. His major study of work is on Safety Systems Management and incorporation of production, quality and safety together. Use of whole safety systems management allows and encourage employees and management to collectively and actively seek the reduction of safety risks and losses with resultant increased production. Shane’s formal education consists of a BS in Business from Liberty University and an MBA with Information Technology focus from Touro University International. He is trained and certified on a variety of safety courses including the OSHA 30, US Army Safety Occupational Certification 40, US Army Accident Investigation Board President Course, Hazardous Material Certification and other courses. Safety awareness on the job and at the home is central to his daily activities. Shane is from Lincoln, Nebraska and grew up with his brother Shawn, who is currently a member of the Lincoln Fire and Rescue who serves as an advisor for this site.